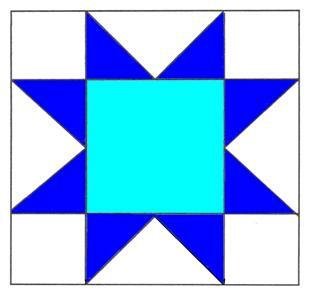 Sawtooth Star Quilt Block 8"
The block is another classic. It is a simple design made up of squares and flying geese and can be very effective in a quilt. Draw a diagonal line on the back of the eight 2½” squares. Set one square on top (right sides together) of the rectangle. This is easier to sew if you start at the center of the rectangle rather than at the corner. sew along the drawn line of the square. trim the underneath two layers away, leaving ¼” seam allowance. sew along the drawn line. trim the underneath layers away, leaving ¼” seam allowance. Now sew the three rows together, taking care to match seams. Now you are done - Congratulations!! Finished with "Sawtooth Star Quilt Block?" Return to "Learn to Quilt"